National Pasta Day is October 17 and like all the best holidays, this one is all about the food. Here are some deals you can score today that won't cost you a pretty penne. Buca di Beppo: This deal isn't just today — it's for the entire month of October, which is World Pasta Month. There are four special pastas you can get only this month. And you can also enter a contest to win a trip to Italy. Carrabba's Italian Grill: Score a cheap bowl of carb-y goodness with these $10 deals (today only). 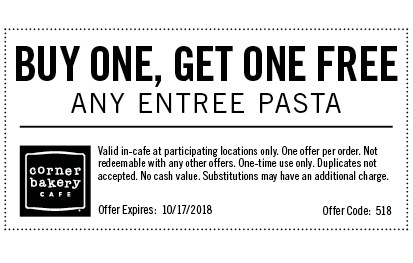 Corner Bakery Cafe: Buy one, get one free on any pasta entree. Just be sure to have the coupon handy. Jewel Osco: Who says you have to eat at a restaurant to score free pasta? Customers can snag a free box of Signature Select Pasta at the register. Just say "Lots a pasta" ( no, really ). Maggiano's Little Italy: Much like Buca di Peppo, Maggiano's is celebrating the whole month of October. Get a pasta dish and take one home for free . The offer itself isn't new to the Italian chain restaurant, but they've been hyping up the "new" pasta options for this deal. Romano's Macaroni Grill: Are you a first-responder? You're in luck. All first-responders can snag a free spaghetti and meatballs until the end of October.